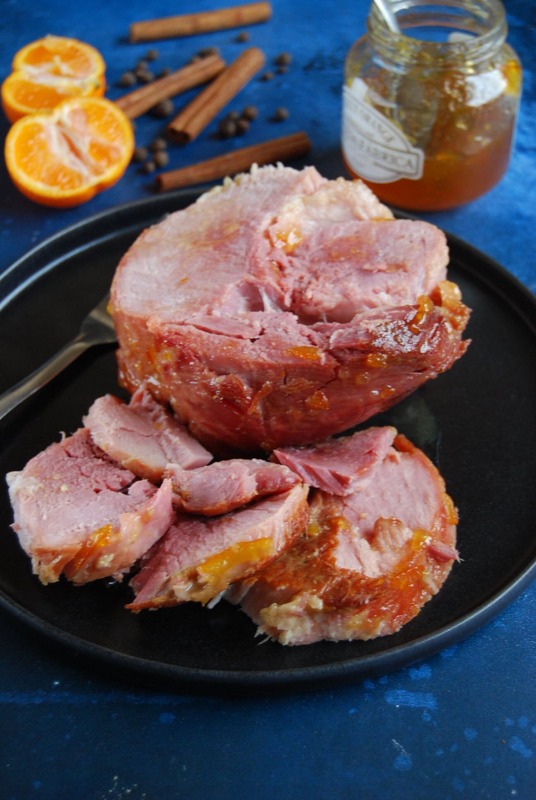 This succulent, juicy orange marmalade glazed ham is perfect for a festive celebration! I couldn’t contemplate Christmas without a ham. It’s such a versatile meat that goes with practically anything – whether it’s part of a slap up roast dinner with roast potatoes, cauliflower cheese or my Christmas spiced red cabbage and roasted veg, served alongside a creamy potato gratin or just good old ham, egg and chips! I cook a ham every Christmas simply because we all love it, but it’s mainly for my number two son who doesn’t do turkey. Not that I mind in the slightest! I look forward to using up the leftovers just as much as I enjoy Christmas dinner. One of my Boxing Day rituals include making us HUGE turkey, ham and stuffing club sandwiches for lunch. They are EPIC and keep us going for the rest of the day. A couple of slices of this sweet, sticky glazed ham really takes the sandwich to another level. My mouth is watering just thinking about it! I’ve included instructions for cooking the gammon on the hob, slow cooker and Instant Pot. This Christmas I’ll definitely be going for the Instant Pot method to free up much needed hob space. 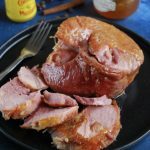 One piece of advice – although you could glaze the ham in the Instant Pot, I believe you get a much better result doing it in the oven. The heat of the oven gives you a beautifully burnished, sticky glaze that the Instant Pot just can’t replicate in the same manner. The gammon joint I used for this recipe makes enough for about 6-8 people. If you have a larger piece then you’ll need to adjust the cooking time – the general rule of thumb is 30 minutes for every 450g (1lb) on the hob. You’ll find cooking instructions and a link for further instructions for the Instant Pot below. Disclaimer – this post contains affiliate links, which means I will earn a small amount of commission (at no extra cost to you) should you wish to purchase any of the items advertised, which enables me to bring you these recipes for free. Thank you! I’m sharing this recipe with #CookBlogShare, hosted this week by Recipes Made Easy. 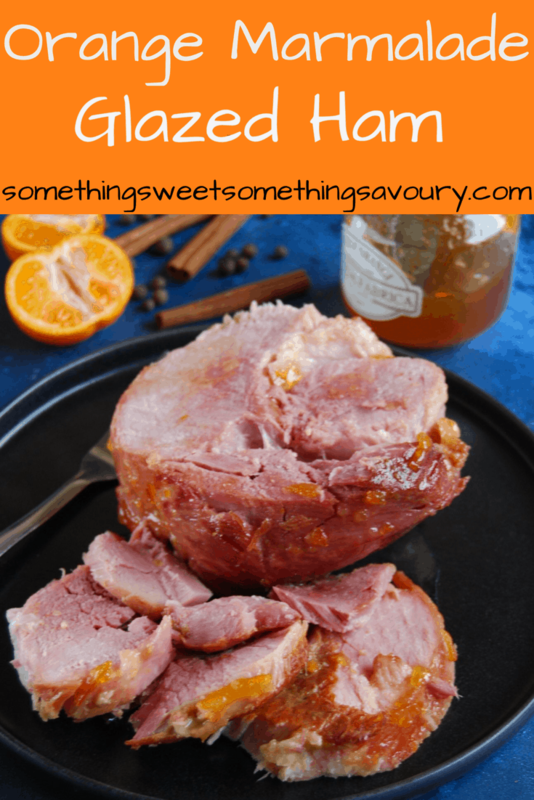 This delicious gammon joint is simmered in orange juice and spices then covered in a sticky mustard marmalade glaze. It's impossible to resist! Place the gammon joint in a large pan and add the cinnamon sticks, allspice berries, halved onion, black peppercorns and the zest and juice of the orange. Pour over the orange juice and top up with enough water to cover the gammon. Bring to the boil and skim off any impurities that rise to the surface. Reduce the heat, cover with a lid and simmer for about 1 1/2 hours. Remove from the heat and leave the gammon in the liquid (you can quite happily leave it for up to 1 1/2 hours if it's easier - or remove the gammon from the liquid and let it go cold if you're cooking it in advance, but bear in mind that it will need longer in the oven if you do this). Place the gammon joint in your slow cooker pot and add the cinnamon sticks, allspice berries, halved onion, peppercorns and the zest and juice of the orange. Pour over the orange juice and enough water to cover the gammon. Cook on LOW for 7 hours. Follow the instructions below for the glaze. Set the timer to 33 minutes (the general advice on the Instant Pot UK community Facebook page is to go for 11 minutes for every 500g which worked perfectly for my 1.4kg joint) Leave the pressure to release naturally before opening the lid and removing the gammon from the pot. Preheat the oven to 200C/180Fan.In a small bowl, mix together the mustard and marmalade. Stir in the orange juice. for 40 minutes if you cooked the gammon in advance. You’re very welcome Jacqui – I hope you enjoy the ham! ? This looks absolutely delicious. I agree, ham is essential at Christmas and my mouth is watering looking at yours! Your ham looks lovely and moist! I love a homecooked ham at Christmas time – so much better than any bought sliced ham you can get. 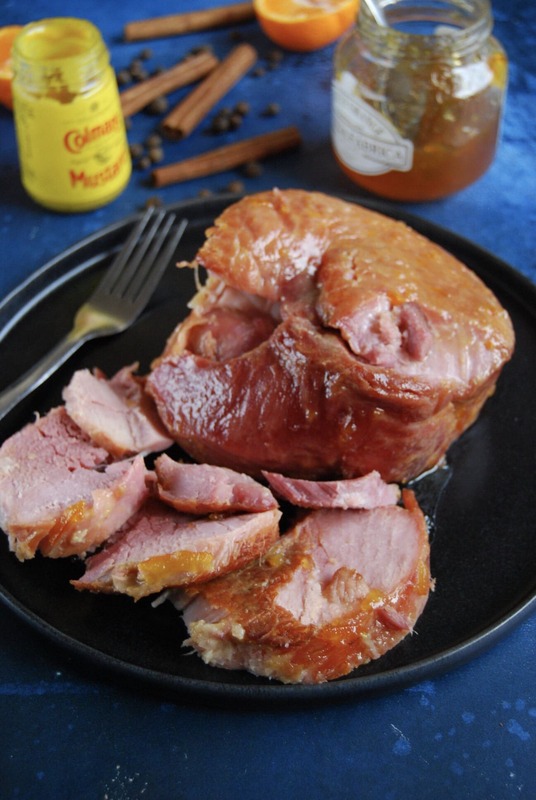 Thanks Corina – I agree, homecooked ham is in a league of its own!